Gazing at each strength training book on my overstuffed bookshelves, I realize how much I've learned from the best ones, how interesting weight training books have helped me lift more, and how that one book on diet really helped me get ripped. I also realize how much money I wasted on crap! The best strength, diet, and weight training books are listed below. Get them if you need some extra guidance and advice. And avoid everything else. There's a lot of drek published in the exercise/strength training field. Avoid most of it, and go hunt down the books below at you local community bookstore (or library or Amazon). McCloud, Aaron. 2011. 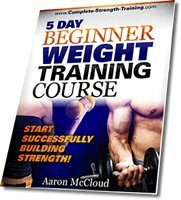 5 Day Beginner Weight Training Course. e-Book. This is my own strength training book, and I really think it's the best option if you're just starting out. It helps you save time by focusing on the important strength training info, and ignoring the rest. If you want to start your weight training the right way, click here! Baechle, Thomas R. 1994. Essentials of Strength Training And Conditioning. Champaign, IL: Human Kinetics. This tome of a textbook is an excellent reference strength training book. I like having it on hand to look up supplements, techniques, and just to browse through. Also, you can put it in a backpack and do push-ups with it if you want to build strength that way. Delavier, Frédéric. 2010. Strength Training Anatomy. Leeds: Human Kinetics. Want to know which muscles are doing what in a lift? This beautifully illustrated strength training book shows you exactly which muscles are targeted in each exercise. Kubik, Brooks D. 1998. 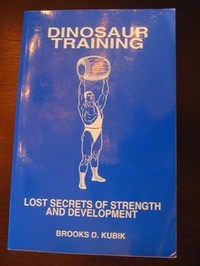 Dinosaur Training: Lost Secrets of Strength and Development. Louisville, KY: Brooks D. Kubik. Kubik has been lifting weights for most of his life, and he knows the mindset to lift heavy. This strength training book is a classic. No tricks here - just focus on big lifts, and pure attitude that'll have you outside pulling your car up a hill before you're halfway though. McGuff, Doug, and John R. Little. 2009. Body by Science: a Research Based Program to Get The Results You Want in 12 Minutes a Week. New York: McGraw-Hill. 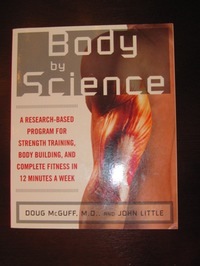 Doug McGuff and John Little have a ton of weight training experience between them and a ludicrous amount of science to back up what they say. If you want to try out a super abbreviated workout routine, or just learn more about the science of the human body as it relates to weight training, this book is a must! Rippetoe, Mark, and Lon Kilgore. 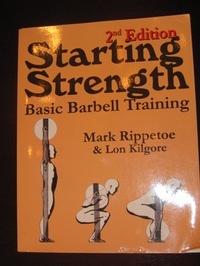 2007.Starting Strength: Basic Barbell Training. Wichita Falls, TX: Aasgaard Co.
Rippetoe, Mark, Lon Kilgore, and Stef Bradford. 2009. Practical Programming for Strength Training. Wichita Falls, TX: Aasgaard Co. Starting Strength and Practical Programming are fundamental books on weight training technique and how to get stronger. Rippetoe knows his stuff cold. Starting Strength obsesses over the basic barbell lifts in painful, excruciating, and beautiful detail, and Practical Programming shows you how to switch up your program and keep making gains from beginner to advanced gym-rat. If you get one strength training book for advanced lifting, make it Practical Programming. Spielman, Ed. 1998. 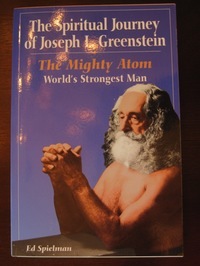 The Spiritual Journey of Joseph L. Greenstein: The Might Atom: World's Strongest Man. Cobb, Calif: First Glance Books. Read this book for inspiration to hear how a tiny 5'3" man (born sickly and with breathing problems) grew up to travel the world boxing, be one of the first westerners to study jujutsu grappling in Japan, and become one of the strongest strongmen in the early 1900's. If he can do it, you sure can. De Vany, Arthur. 2011. 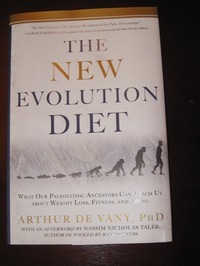 The New Evolution Diet: What Our Paleolithic Ancestors Can Teach Us About Weight Loss, Fitness, and Aging. Emmaus, Pa: Rodale. Arthur De Vany packs a lot of good content into this diet and strength training book. Even if you don't eat 'paleo' style, eating lots of veggies and lean meats (especially fresh seafood) is a great health choice, and his workout ideas are very interesting. Pilon, Brad. 2007. Eat STOP Eat. Strength Works, Inc. E-Book. Pilon's e-book is actually quite good, a step up from most of the e-books out there. This work looks at intermittent fasting (I.F. ), how you can avoid eating every 3 hours, and why you won't lose muscle or kill yourself by restricting your eating to a 4 or 8 hour block of time. He has a lot of cool science in there, so if I.F. 's your thing, definitely read this one. Pollan, Michael. 2009. 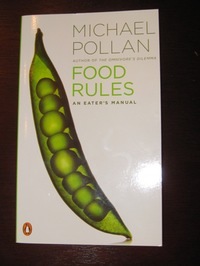 Food Rules: An Eater's Manual. New York: Penguin Books. This fun, short book gives simple pieces of wisdom about how to eat healthy, real food. Taubes, Gary. 2007. Good Calories, Bad Calories: Challenging the Conventional Wisdom on Diet, Weight Control, and Disease. New York: Knopf. This mammoth book (over 500 pages, and several hundred of footnotes) documents Taubes' investigations into the history of the 'fat is bad' idea. If you want to know more than you ever wanted to know about insulin, metabolism, and the dangers of refined carbohydrates, check this out. Taubes, Gary. 2011. Why We Get Fat And What To Do About It. New York: Alfred A.Knopf. 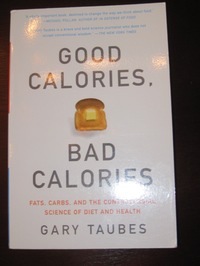 This is a shorter version of Taubes' Good Calories, Bad Calories, only 200-ish pages long. If you want to hear his best arguments without all the scientific background, this is a good book. He also includes the diet given to extremely obese patients at the Lifestyle Medicine Clinic in Duke University's Medical Center (spoiler: lots of eggs and bacon). Willey, Warren. 2007. Better Than Steroids. Victoria, B.C. : Trafford. If you want to stay lean while putting on muscle withoutsupplements, steroids, or silly tricks, you need to read this diet and strength training book. Simply put, it's everything you ever wanted to know about nutrient timing and eating to put on muscle and not fat. Davies, Clair. 2004. The Trigger Point Therapy Workbook: Your Self-Treatment Guide for Pain Relief. Oakland, CA: New Harbinger Publications. If you have aches and pains, buy this book. Then you won't have them anymore. Seriously, an excellent book for massaging out tight muscles that you didn't even know you had. I recommend it to anybody who comes to me asking about muscle, joint, and other nagging pains. • Click here to leave 'The Best Strength Training Book Is…' & go back to the Home-page!